Spring is here and with the summer months fast approaching it’s prime time for picnics, out door bbq get togethers, and parties. 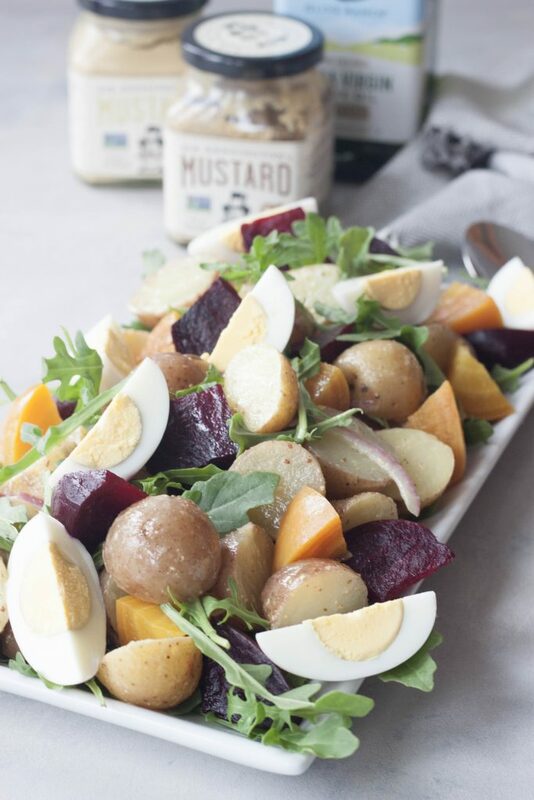 This Roasted Beet Potato Salad is anything but boring and will spicy up your picnic, bbq, or potluck! Craving it I also turned it into a dinner for the family, or it’s another way to enjoy and use up those leftovers. It seems like almost every week in the summer I’m trying to decide on a salad and dessert to make for a picnic, dinner, bbq, trip to the cabin, potluck, or some get together. Usually it’s requested that I bring a dessert but I also like to bring a healthy side dish. I usually have lots of ideas and favorites but sometimes, ok often, I can be indecisive. It often comes down to where it is, the temps, what’s being served, who will be there, and my mood. It’s no secret that I like my beets. 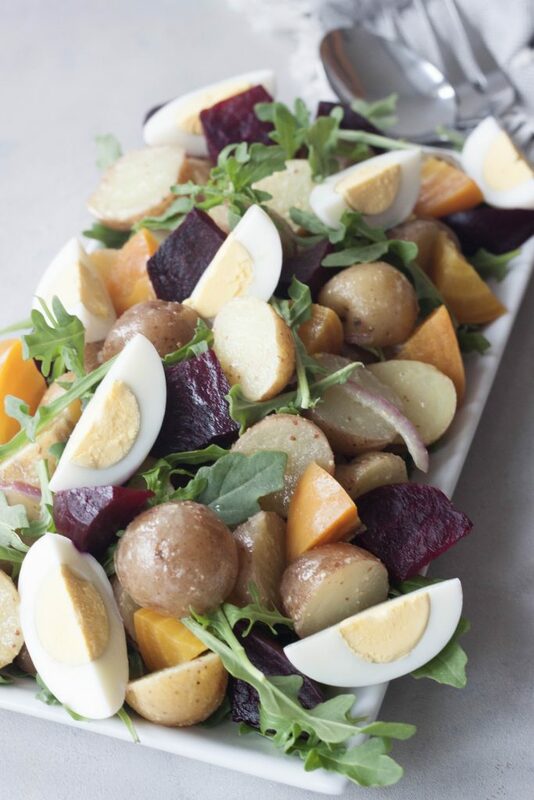 I’m not usually a fan of potato salad but add beets and leave out the mayo and I’m there! I’m always looking for ways to spice up summer parties and make something different. 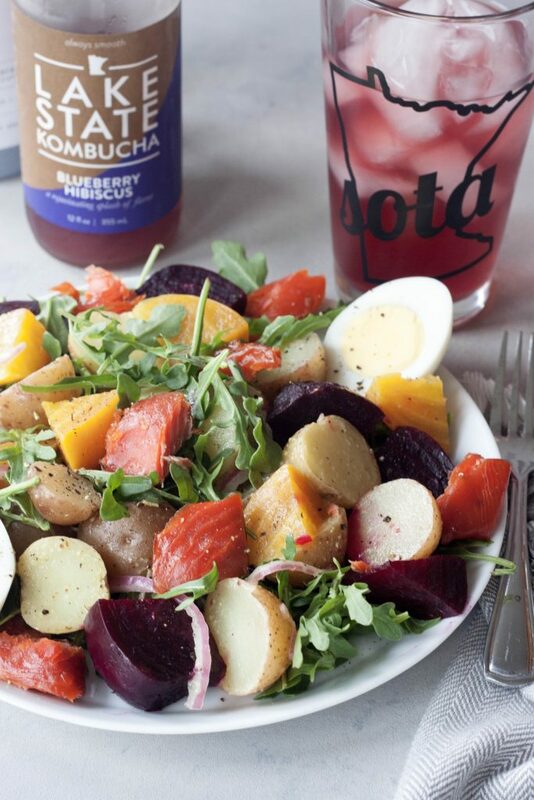 This Roasted Beet Potato Salad is a colorful salad that also adds veggies, or a little beet boost I should say. I also add in a little greens for extra nutrition, color, and texture. Instead of mayo, since I’m not a fan and it’s pretty much the reason I don’t like potato salad, I use a light mustard vinaigrette made with extra virgin olive oil, champagne vinegar, and mustard. Not heavy and overpowering but gives it flavor, coats it, and pulls the salad together. I also like to use both red and golden beets but you can use just one if you want. If you can only find red, use red. If you’re worried about the coloring or stains then use golden. This is actually a salad I brought to Easter this year. Craving it after since I didn’t get my fill with all the other food there and the fact that we had a brunch just before I whipped it up and turned it into a dinner adding some smoked salmon. I could have cooked salmon but it was a quick improve thing and I had some smoked salmon I had wanted to use up. Trust me when I say this isn’t your grandma’s or great aunts potato salad but they will definitely approve! What’s your favorite picnic or summer BBQ food? Wash and trip beets, wrap in tin foil and place on a rimmed baking sheet. Roast beets at 375F for 30- 60 minutes depending on the size of beets. Bring a pot of water to a boil. Add potatoes and cook for about 15 minutes or until able to pierce with a fork. Let beets cool. Once beets are cool enough to touch remove from foil, and remove the peel which should slide right off. Slice into quarters or eighths depending on the size of your beets and place in the refrigerator to cool, keeping separate if possible. Cut potatoes in half and place in the refrigerator to cool. In a large bowl whisk together olive oil, vinegar, and mustards. Add potatoes, and onions and toss to coat. Just before serving add arugula and toss. Quarter hard boiled eggs. 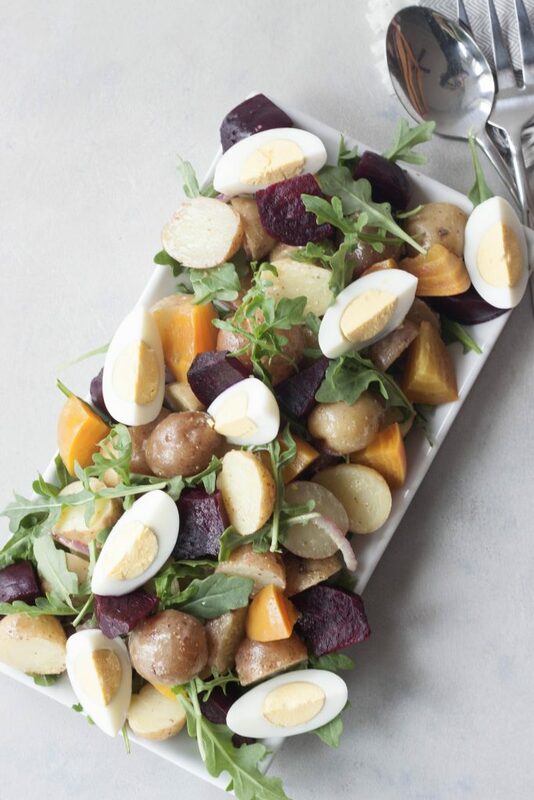 Arrange on a platter with beets and hard boiled eggs or toss everything together in a bowl. If tossing in a bowl the eggs will break apart and the red beets will bleed some but it still tastes good and it hasn’t stopped anyone from eating it. Enjoy! Like it? PIN it for later (two options)! I don’t know why I never thought of beets and potatoes together! I usually only have them with sweet potatoes. I love the addition of beets to potato salad. Why did I never think of that?! 🙂 Definitely giving that a try! I had the same thought when I first thought of it. Before I had only done beets and sweet potatoes. Yes! love the addition of beets and no mayo! This looks great and so simple to make. Looks delicious! I love your twist on potato salad! The beets really jazz it up! And the mustard vinaigrette is a great alternative to mayo! Thank you! I love beets so I had to and I’m not a fan of mayo and I love the flavor the mustard vinaigrette adds. This kind of salad is so healthy and contains all the necessary nutrients. Great recipe!